The first few weeks of 2014 promise to deliver a smorgasbord of entertainment. There's the Golden Globes, the Grammy Awards, the Winter Olympics, and the Super Bowl. The Monuments Men is coming to theaters, and a new season of Girls is coming to HBO. There's a lot happening offline, too: Restaurant Week in Chicago, Madison, and beyond. Concerts. Art shows. Winter beer festivals. Book releases. But there's a problem. Keeping up with every interesting event is a trying task that involves endless online research. And wouldn't it be a shame to miss the upcoming Chicago Travel & Adventure Show, or the Chicago Sketch Comedy Festival, the largest of its kind? 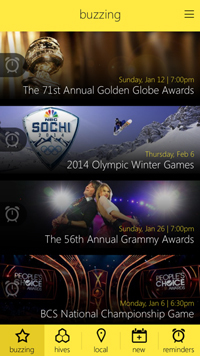 Over the holidays, a new mobile app launched that aims to help us keep all of these events - and more - straight. It's a digital life hack designed to make watch lists manageable and introduce you to new events worthy of your time. Called BeeReminded, the free iPhone and iPad app lets users explore all manner of happenings, and create custom reminders for existing favorites. As with every good modern app there's a social element, too: the Buzzing section shows you what's coming up, with a focus on local entertainment, and you can share the events you're most excited about with friends by way of Facebook or Twitter. Either social network can be used to create your BeeReminded profile as well as your Hives, a personalized and chronological list of events. You can get a sense of the experience by watching the video below, and download the app here. It's a new year, full of new content. Let's make sure we don't miss a thing.